On your marks, get set, ride on! Plasmart's PlasmaCar takes the lead once more, followed by trusty Rody and relative newcomer Ezy Roller, said the 11 of 15 surveyed specialty store owners who carry ride-ons. Rody - Mocha by TMI TOYMARKETING INTERNATIONAL INC.
Other products from TMI TOYMARKETING INTERNATIONAL INC.
Gymnic Line’s Rody Horse, a favorite with children to learn balancing and coordination while hopping on their Rody. (Base is available for transforming to a Rocking Rody Horse). Used in Therapy for special needs children due to its softness and ride-on qualities. Made of super strong, latex-free vinyl, inflates according to size and weight of child with a hand or foot pump. Maximum inflated height to “saddle” is 12 inches. Recommended for 3 years and up, with adult supervision. — Six of 37 specialty retailers named Rody as a best-selling ride-on in March 2010. Amazing Toys in Great Falls, Mont., sells about four Rodys per month, Owner Dave Campbell told TDmonthly. This sleek ride-on is fueled by cambering motion — the rider pushing his or her legs against the front bar, to the left and right. It has a hand brake and features an extendable design to host riders up to 6' tall. Maximum recommended weight is 150 lbs. — Learning Tree Toys, Games & Books in Oklahoma City, Okla., sells about a dozen EzyRollers per month, Owner Patti Tepper-Rasmussen told TDmonthly in fall 2009. — Jackie Roy, owner of Learning Resources Toy Magic in Fort Walton Beach, Fla., told TDmonthly in late 2009 that she brought in five EzyRollers on trial on sold out in a week and a half. — Two of 37 specialty retailers cited the EzyRoller as a top-selling ride-on in spring 2010. “The EzyRoller, by far, continues to be the best,” Christine Osborne of Wonder Works in Charleston, S.C., told TDmonthly in March 2010, reporting sales of a couple dozen per month. This American-made, child-powered ride-on toy features an injection-molded polyethylene seat. Kids simply put their feet on the handlebars and swing the handlebars side to side with their hands to generate movement. The Flying Turtle, which comes pre-assembled, may be used both indoors and out, and holds up to 150 lbs. — Deborah Smith, owner of Toys That Teach in Richmond, Va., listed the Flying Turtle as her best-selling ride-on toy in a March 2009 survey. “In spring and summer, [we sell] at least a dozen per month,” she said. — Five percent of 60 retailers told TDmonthly in spring 2009 that Mason Corporation's Flying Turtle is a best seller in their stores. — Three of 37 retailers named the Flying Turtle when discussing best-selling ride-on toys in spring 2010. Creative Kids Inc. in Columbia, S.C., sells about three dozen annually, Owner Melodie Ingwersen told TDmonthly in March 2010. This brightly colored trike offers kids and parents a large array of features to adjust to various situations. The durable metal body supports an adjustable seat to accommodate the growing preschooler, and the tricycle easily goes from a kid-powered pedal-along to a push trike that the parent can easily steer. Patented internal gears allow the wide, stroller-style push bar to turn the front wheel of the trike, and free-wheeling pedals allow the rider to comfortably coast while the adult pushes. — “Radio Flyer Steer & Stroll Trike. [We sell] four per month,” Mike DiAndrea, manager of Hardware Centre Inc. in Paoli, Pa., said of his best-selling ride-on toy during TDmonthly's March 2009 survey. — Seven percent of 60 retailers listed Radio Flyer as the manufacturer of their top-selling ride-on toys in spring 2009. — Two of 37 retailers named a trike by Radio Flyer as a top-selling ride-on in spring 2010. This colorful bike folds up for easy portability and storage, and has an easy-to-carry handle grip. It comes fully assembled for instant riding, and features sturdy steel construction, a low center of gravity for maximum stability, and a controlled turning radius. It is suitable for ages 18 months and up. The Fold 2 Go received the 2007 Outdoor Toy of the Year Award from the Toy Industry Association. — Though Radio Flyer is known for its line of wagons, two retailers that spoke with TDmonthly specifically cited Radio Flyer tricycles as winners in the ride-ons category. — “The RadioFlyer tricycle is a traditional ride-on that still sells very well,” Matt Sahagian, owner and manager of Learning Express of Action in Action, Mass., told TDmonthly. 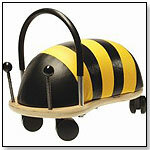 Wheelybug Large Bee by PRINCE LIONHEART INC.
Other products from PRINCE LIONHEART INC.
Wheely Bugs are hand-crafted ride-on toys that go backwards, forwards, sideways and in circles. They provide free movement so children can be entertained while developing gross motor skills. Wheely Bug by PRINCE LIONHEART INC.
― Wheely Bug was a Toy Fair favorite spotted by Terry Myers, owner of Kaleidoscope Toys in Round Rock, Texas. It was voted Toy of the Year in BabyTalk's Dec. 2006/Jan. 2007 issue and received the 2007 Silver Award for Best Baby & Infant Product in The Netherlands. — This handmade Australian toy earns gold stars for everything — wooden base, sturdy construction, simple design, adorable themes, easy-to-clean seat, multi-directional motion and two size options — all adding up to its receipt of a TDmonthly Top Toy 2007 award. — Two of 60 retailers in a March 2009 survey listed Prince Lionheart Wheely Bugs as a best-selling ride-in in their stores. 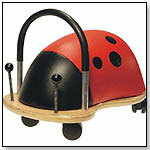 The Wheely Bug was a best seller at Golden Apple Learning Store in Pleasanton, Calif., in summer 2009. This wooden trike is sturdy and durable. It can hitch up to a little wooden trailer so toddlers can pull their treasures along with them. It measures 14" x 33" x 14".